Coming up: online marketing workshops for New Zealand and Australia libraries! I'm absolutely thrilled to say I'm working with PiCS again, this time to deliver online training. With PiCS I've previously run marketing training in Sydney, Melbourne and Brisbane, and an emerging technologies in Auckland, and they always go all out to put on the best possible day. If all goes to plan I'll be back in Oz in 2018 to deliver some face-to-face workshops on Presentation Skills (aimed specifically at information professionals), and in the meantime we're collaborating on three workshops online: Marketing your library (running across March, April and May), Digital Marketing and Online Tools (running in June) and Social Media: Next Steps (running across July and August). Anyhow, I'm really looking forward to this. All the courses are tailored for the online environment and I promise we won't be in the standard 'death by webinar' mode here: these are interactive, participatory, and hands-on workshops: you'll be DOING as well as watching and listening. It's going to be ace. For info on the content and booking etc see the individual workshop pages linked above - for the rest of this post I'm going to use a Q&A format to explain some more about how these sessions will work. Each session is 2 hours long - any more than that is too much screen time in my experience. There'll be a 5 minute break in the middle, and pratical exercises throughout so it's by no means listening to me for 2 hours. Then there's a week off and a second session of 2 hours, and in between there might be some activities to explore and report back on. So in total each set of workshops will take 4 hours. Will I be able to ask questions and interact with fellow attendees? Yes absolutely. I use two screens, one of which has the discussion window open the whole time - so I can pick up questions as they come in rather than needing a section of the training where a moderator coordinates the questions. You can also talk to each other in the discussion. And you can message me in the session if you want to ask a non-public question. Could I attend all three courses or is there overlap in content? All three courses are about communciation so certain themes run through each, but none of the fundamental content is the same and none of the tasks and exercises are the same. 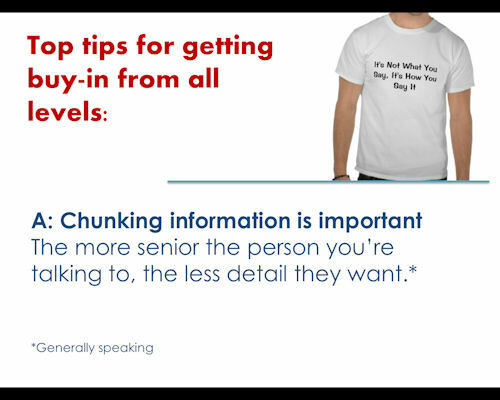 I came to your LIANZA marketing workshop on marketing - should I still sign up for the online version? The workshop at LIANZA was a super-condensed version of the workshop, crammed into 1.5 hours and needing to work for 130 people! Places on these new sessions are limited to small numbers, and over more than twice the time, so the marketing one does contain a lot of material that wasn't included at LIANZA. I've also added a few new sections to the training since late 2015. However there is some overlap! So you'll hear a few things you heard previously. But I'd say there's enough new and additonal content to make it worthwhile. I came to your Digital Marketing & Online Training full day in Auckland - should I still sign up to the online version? I'd say 'no'. Although there's new content since the Auckland workshop, a lot of it will cover similar topics so you'll find yourself repeating exercises. Of course you're more than welcome to attend anyway! But I'd recommend attending one or both of the other two workshops (Marketing your library service, and Social Media: Next Steps) instead. I came to your Marketing Your Library full day in Brisbane / Sydney / Melbourne - should I still sign up for the online version? The workshop does have some new sections in since the sessions I ran in Australia but a lot of the content is similar, so I'd recommend signing up for one of the other two online workshops instead. Can I see just the workshops listed for my time zone? No problem, either leave them in a comment, or send me an email. I look forward to seeing some of you online! 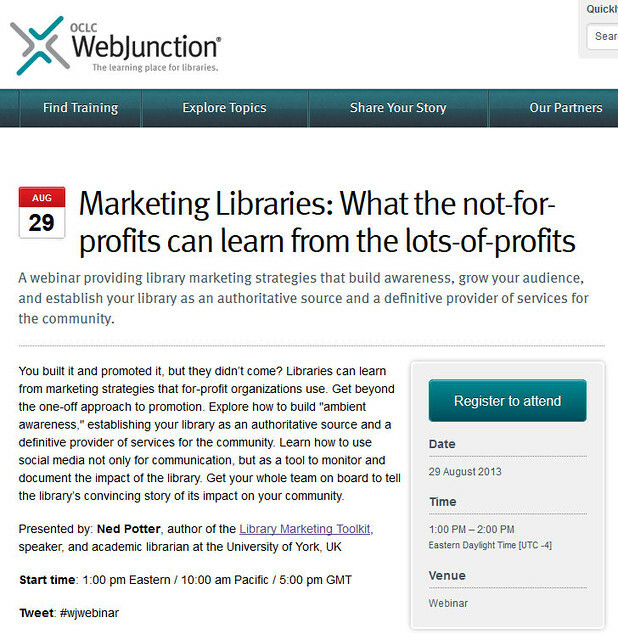 Just a quick heads-up that on the 29th of August, I'm running a webinar for WebJunction and my hope is it'll have a lot of useful information for anyone interested in marketing their library successfully. Details below - click the pic to go the website where you can sign up. Places are limited to 1500 and believe it or not we've already got 1300 people registered, so hurry! So if you think this sounds like it may be useful to you, go to the WebJunction site and click the button to register. I've always found Web Junction materials really useful - particularly when writing my book - so I'm excited about doing something with them, particularly something that anyone with an internet connection can come along to. Hope to see some of you there. I was really pleased to take part in the Annual programme for the ALA's New Members Round Table, last week - it was a webinar and the whole thing was recorded. 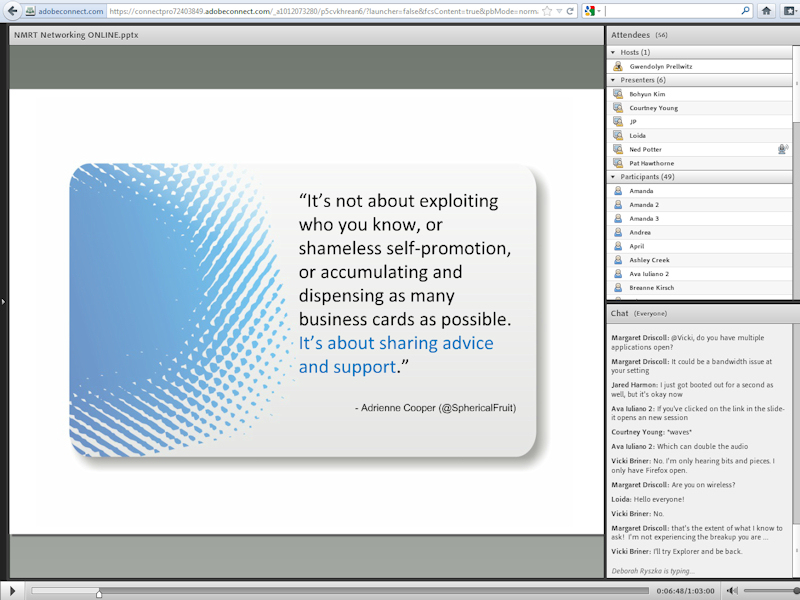 You can watch and listen to it online here (it opens in Adobe Connect) - I talk about the 'What' of networking (starting around the five-and-half-minute mark) and finish things off with the 'Why' (around 42 minutes) - in between the How, Who, Where and When are covered by Loida Garcia-Febo, Courtney Young, JP Pocaro and Pat Hawthorne respectively. Huge thanks to Bohyun Kim for inviting me to present - it was nice to take advantage of the technology to do something with the ALA without having to be at the conference in the US, and I enjoyed the webinar a lot. Appropriately, I made a few connections at the event and found it to be good networking experience. If developing a brand is a natural byproduct of pursuing your professional interests in as networked a way as possible, then developing a network is a natural byproduct of the same thing, really. Related to the above: in my experience it's easiest to develop a network by positioning yourself as part of the dialogue in librarianship and contributing, than for example saying 'I'm going to make X connections' and actually setting out specifically to develop a network or market yourself . I find my network (essentially: you lot) to be THE single most useful thing in my professional life, and in the webinar I reflected on a clear delineation (marked by the 2009 New Professionals Conference) of pre-networked-Ned and networked-Ned - all the interesting things have happened in the latter period. I could neither have written my book nor got my current job without my network. So a: thank you! And b: if you're wondering about taking the plunge and networking more, it's worth it. Becoming part of something bigger is a great thing.